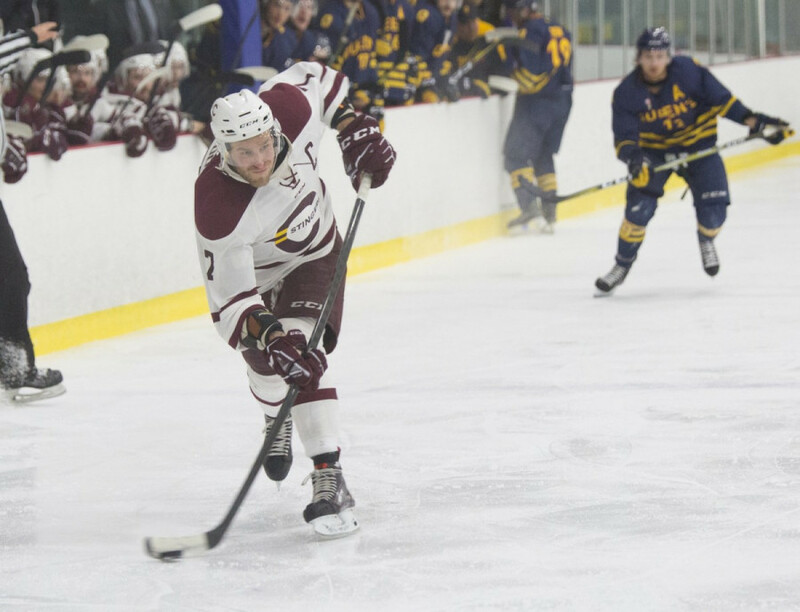 After playing to a first period stalemate, the Concordia Stingers men’s hockey team found themselves down a goal early in the second period of game two of their best-of-three series against the Queen’s University Gaels. A packed Ed Meagher arena was hoping to celebrate a second consecutive playoff sweep as the Stingers had taken game one of the series on Wednesday night in Kingston. Queens’ Duncan Campbell scored in the second period to give his team a 1-0 lead. Soon after, a string of missed calls by the referees had Concordia looking frustrated, and the negative body language off the ice led to sloppy play on it. Before the end of the second period, the visibly uncomfortable home team had let in another goal, this time courtesy of Queen’s forward Ryan Bloom. To make matters worse, the Stingers lost their starting goaltender Marc-Antoine Turcotte to an injury before the second period buzzer. First-year goalie Antoine Dagenais came on in relief. As the game wore on, the Gaels defense proved to be too vexing for the Stingers. Queen’s goaltender Kevin Bailie was his usual self, stopping 47 shots after having an off game in the series opener. With just a few minutes left in the game, Queen’s forward Darcy Greenaway put the game on ice with a power play goal. Aside from the injury to Turcotte, Concordia’s roster was as healthy as it has been since the team returned to action after the winter break. Defender Alexandre Gosselin, who had been out with an undisclosed injury, saw his first game action in the game. He did, however, see a reduced workload as the team hopes to bring him back slowly and see his role expand as the playoffs continue. Forwards Charles-Eric Legare and Dominic Beauchemin were also back in the lineup after missing time. The series will now head to a decisive third game Sunday afternoon in Kingston.